Prepare to be transported into a world of water, wonder and fantasy as “WOW,” the internationally-acclaimed production, will make its North American debut with a splash at the Rio Showroom at Rio All-Suite Hotel & Casino in Las Vegas September 26, 2017. 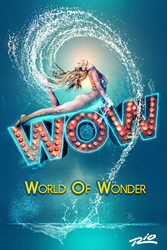 Prepare to be transported into a world of water, wonder and fantasy as “WOW,” the internationally-acclaimed production, will make a splash at Rio All-Suite Hotel & Casino in Las Vegas. “WOW” is a water entertainment spectacular that transforms the ordinary into the extraordinary. The cast of more than 30 international performing artists, acrobats and dancers fly, flip, fold, dance and defy the imagination in a 180 degree theatrical setting that engages the audience from beginning to end with 3D multi-media projections, water walls, and holograms. Add breathtaking acrobatics, dazzling choreography, thrilling theatrical lighting, magnificent music and even finalists from America’s Got Talent, and you are sure to be wowed! Created and directed by famed director Hanoch Rosènn, “WOW,” the long-running circus-style show features delights, dangers and water. Rosènn is known worldwide for his extravagant and large-scale productions - including “Festigal” where he directed "Wonder Woman" star Gal Gadot in her stage-acting debut in 2008. Rosènn created “WOW” as a fast-paced, stunning spectacular which, to date, has been seen by more than 2.5 million people. In preparation for its North American premiere, the Rio Showroom at Rio All-Suite Hotel & Casino is being transformed into a world of water including a custom-built stage and pool that promises an up-close and interactive audience experience. 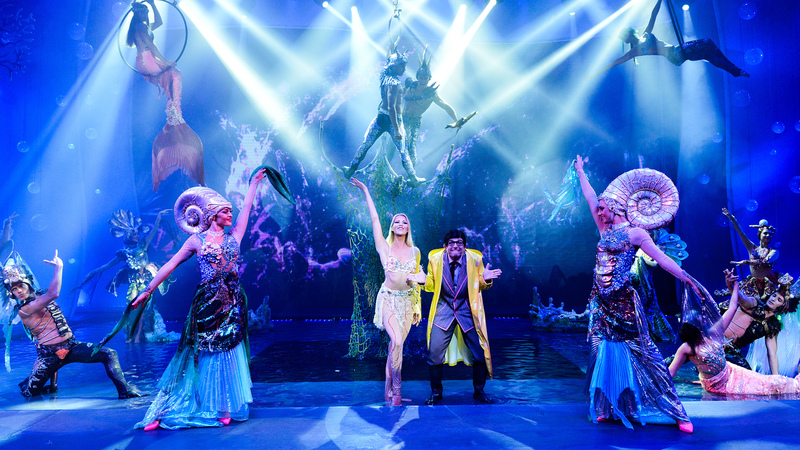 Though grand in scale, design and production, the family-friendly show will provide Las Vegas audiences with an intimate theatrical water show adventure unlike any other. Among the many dynamic performers during the 90-minute show who will be a part of the “WOW” cast include America’s Got Talent semi-finalist, Sylvia Sylvia – whose jaw-dropping archery act of shooting an apple off of her own head left judges and audiences spellbound. In addition the international cast features some of the greatest acrobats and specialty acts from the USA, Canada, Italy, the Netherlands, Ukraine, France, the UK and more. The water spectacular “WOW” will play at the Rio Showroom at Rio All-Suite Hotel & Casino Tuesday through Sunday at 7:00 p.m with additional shows at 9:00 pm Friday through Sunday. Show will be dark Friday, September 29. Tickets will go on sale Friday, August 11, 2017 and range from $49 - $169 + taxes and fees and can be purchased at the Rio Box Office, Ticketmaster, RioLasVegas.com or by calling 702-777-7776. Prepare to be transported into a world of water, wonder and fantasy. Experience the internationally-acclaimed production, seen by more than 2.5 million people, that transforms the ordinary into the extraordinary. More than 30 artists fly, flip, fold, dance and defy the imagination in a 180 degree theatrical setting that engages the audience from beginning to end with 3D multi-media projections, water walls, and holograms. Add breathtaking acrobatics, dazzling choreography, thrilling theatrical lighting, magnificent music and even finalists from America’s Got Talent, and you are sure to be wowed! “WOW” is produced by: R&R Entertainment; Jon B. Platt (winner of 12 Tony Awards on Broadway and the Olivier Award in London. In 2012 Mr. Platt accepted the Robert Whitehead Award as the Most Distinguished Producer on Broadway, reflecting his roster of well over 50 shows including Wicked and The Book of Mormon. Mr. Platt was bestowed a rare Lifetime Membership in The Broadway League); Yacov Neeman and Doron Etzioni - Tevet Productions (entrepreneurs, managers and producers with 35 years of experience. They have initiated the WOW Variety experience 15 years ago and have managed it ever since. Amongst other activities they are producing music, films, events and specialize in international circus tours. ); Corey Ross, founder of Starvox Entertainment (productions include Cats, Evil Dead, Disenchanted, Potted Potter, Cannibal the Musical, Faulty Towers- Live, Sherlock Holmes and many more); and Jordan Fiksenbaum and Brad Goldberg – Informed Marketing (Leveraging their past experience with Cirque du Soleil and MGM Resorts International, Informed Marketing is a marketing organization focused on providing our partners with innovative sales & marketing solutions for live entertainment productions, attractions and hospitality companies). Rio All-Suite Hotel & Casino, home of the World Series of Poker, offers guests a unique all-suite hotel experience. Complete with 2,522 all-suite hotel rooms – including the Samba suites and the luxurious Palazzo Villas with a private entrance – the property overlooks the Las Vegas Strip and sits one block west of the famed boulevard. A variety of entertainment options at the resort include headliners Penn & Teller and the world-famous Chippendales. Additionally, Rio Las Vegas is home to family-friendly attractions such as the VooDoo Zip Line, an adrenaline-rushing thrill ride that offers a 360-degree panorama of the famous Strip from 490 feet above the ground, as well as KISS by Monster Mini Golf (opening May 2016). The off-Strip resort features a diverse array of dining and nightlife experiences including the new Guy Fieri’s El Burro Borracho, VooDoo Steak, Wine Cellar & Tasting Room, Hash House A Go Go, KJ Dim Sum & Seafood, iBar, VooDoo Beach and VooDoo Rooftop Nightclub, which offers panoramic views of The Strip. Just a short drive from Rio Las Vegas, Rio Secco Golf Club – recognized by USA Today as one of the “Top 10 Golf Destinations in the World” – is an 18-hole championship course designed by famed architect Rees Jones and home to the Butch Harmon School of Golf. For more information, please visit riolasvegas.com or the Caesars Entertainment Las Vegas media room. Find Rio All-Suite Hotel & Casino on Facebook and follow on Twitter and Instagram. Prepare to be transported into a world of water, wonder and fantasy as “WOW,” the internationally-acclaimed production, will make a splash at Rio All-Suite Hotel & Casino in Las Vegas.Prepare to be transported into a world of water, wonder and fantasy as “WOW,” the internationally-acclaimed production, will make a splash at Rio All-Suite Hotel & Casino in Las Vegas. Prepare to be transported into a world of water, wonder and fantasy as “WOW,” the internationally-acclaimed production, will make a splash at Rio All-Suite Hotel & Casino in Las Vegas.Prepare to be transported into a world of water, wonder and fantasy as “WOW,” the internationally-acclaimed production, will make a splash at Rio All-Suite Hotel & Casino in Las Vegas. Prepare to be transported into a world of water, wonder and fantasy as “WOW,” the internationally-acclaimed production, will make a splash at Rio All-Suite Hotel & Casino in Las Vegas.Prepare to be transported into a world of water, wonder and fantasy as “WOW,” the internationally-acclaimed production, will make a splash at Rio All-Suite Hotel & Casino in Las Vegas.